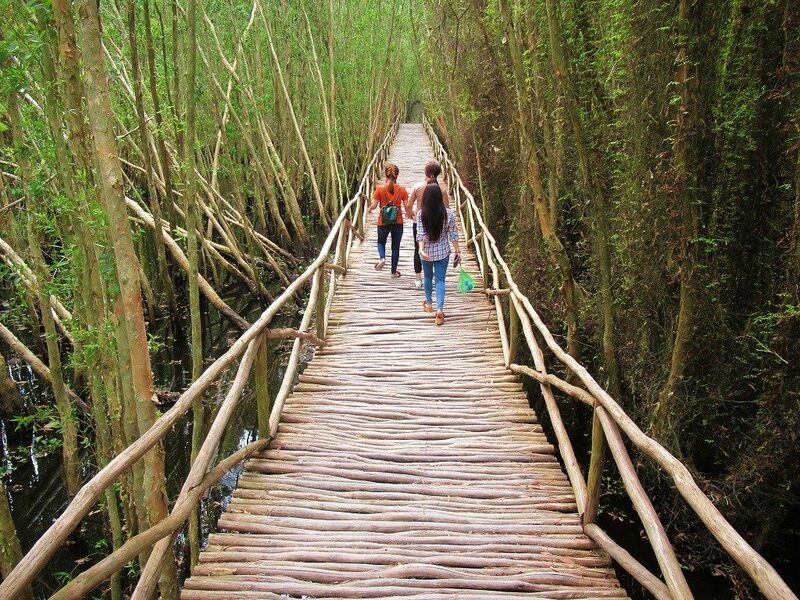 Only 100km west of Ho Chi Minh City, Làng Nổi Tân Lập is an enchanted patch of wetland where cajeput trees rise from the black, swampy waters creating beguiling corridors through which canoes glide and raised walkways wind. Located in Long An Province, whose vast, flat, agricultural lands stretch right to the Cambodian border, Làng Nổi Tân Lập literally means, ‘Tan Lap Floating Village’. 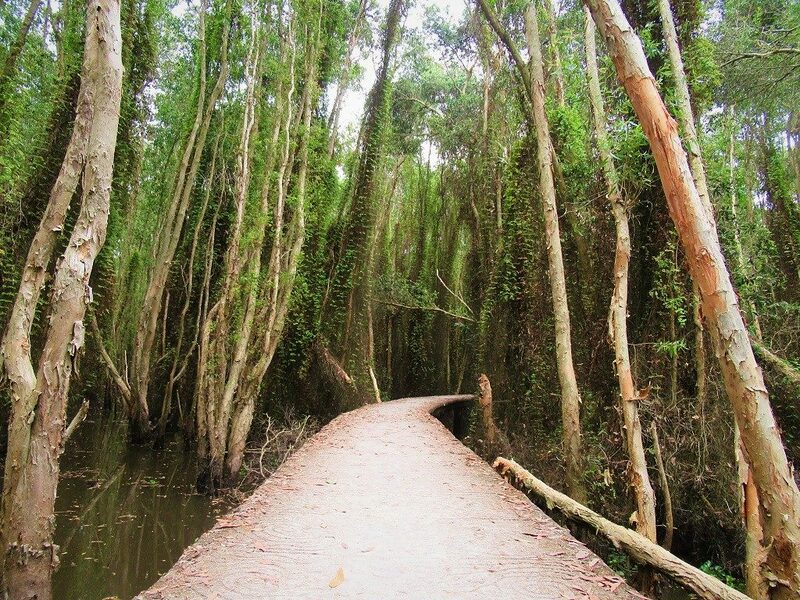 However, I think ‘floating forest’ is both more accurate and more romantic, and that is how I will refer to it throughout this guide (which, I guess, would make it Rừng Nổi Tân Lập in Vietnamese). 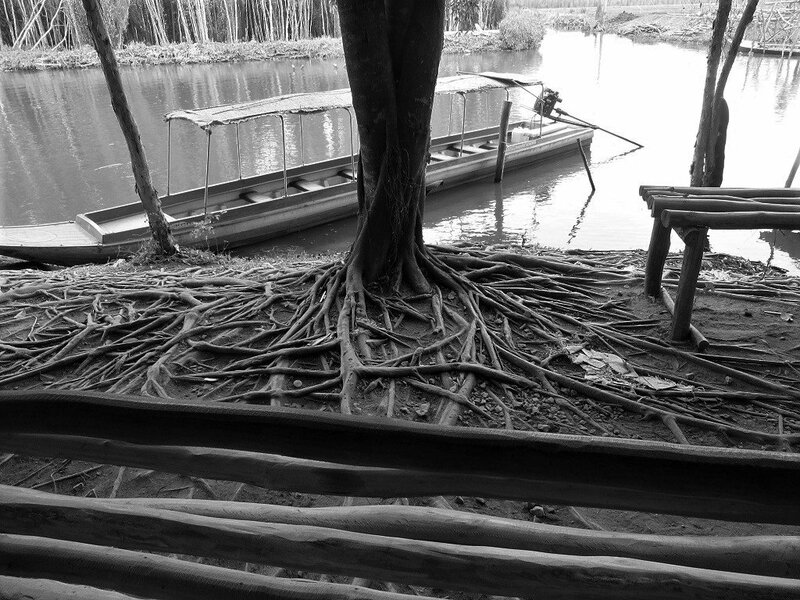 Within 2 hours’ ride of Saigon, the Floating Forest is ideal for a day-night trip from the city, especially by motorbike. There’s camping and accommodation at the Floating Forest itself, or you can combine a visit here with a night in a wooden hut at the wonderful lotus lake homestays in nearby Thap Muoi. Either way, this is a great way to spend 24-48 hours away from the Big Smoke. 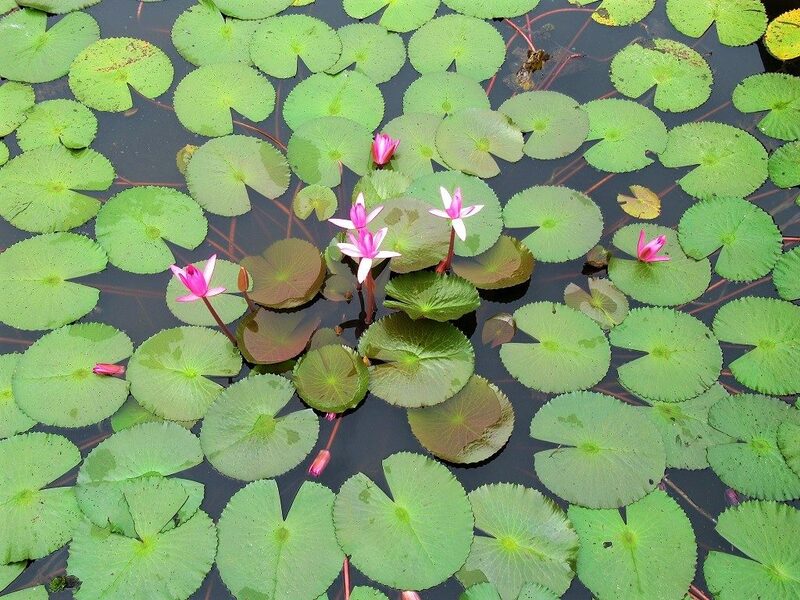 In the following guide, I’ve written an overview of visiting Tan Lap Floating Forest, including ticket prices, activities, and accommodation information. 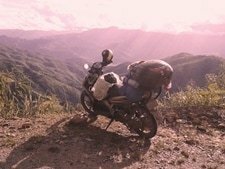 I assume that most travellers will make their own way here from Saigon on two wheels, via roads QL N1 and QL62. 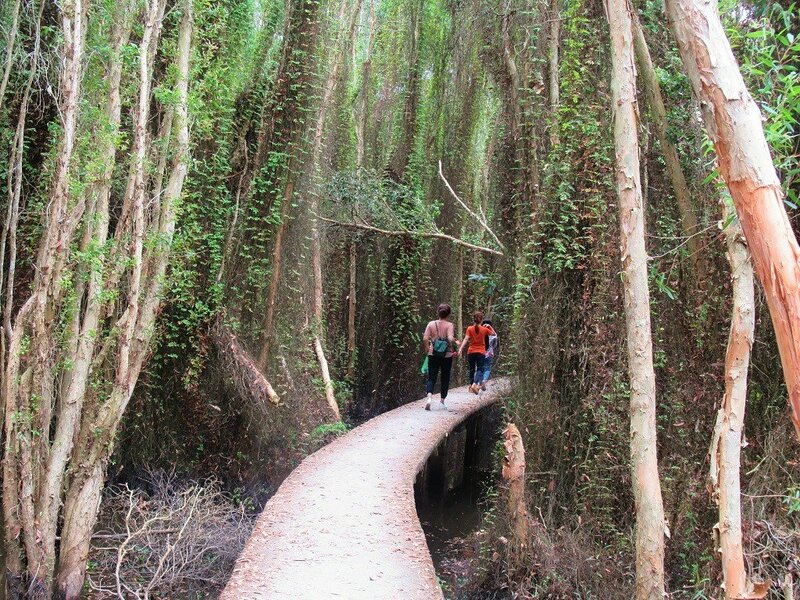 The Floating Forest is great as a day-night trip from Saigon, but also as a stop on a longer road trip in the Mekong Delta, for example the Mountains in the Mekong route, or Riding to Phu Quoc Island. 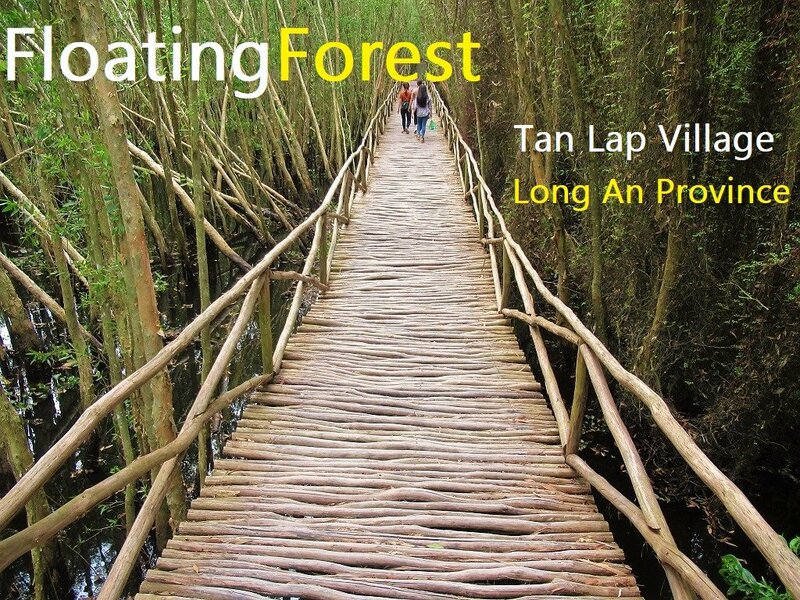 Ever since I first heard about Tan Lap Floating Forest, I was skeptical: Long An Province is not a place I associated with forests and natural beauty. Rather I saw it as an industrial suburb of Saigon: a place where the factories, which drive the southern hub’s economic boom, sprawl to the pollution-blurred horizon. 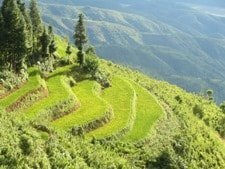 But Long An is a big province, spreading 200km west of Saigon into the agricultural heartland of the Mekong Delta, and it changes quickly from urban to rural. Indeed, to get to the Floating Forest it is necessary to ride through the awful, dust-choked industrial zones, but, after an hour or so, the air clears and the traffic fades: fields and trees replace factories and fumes, the ashen sky becomes blue, green seeps into the landscape, and nature replaces industry. Suddenly, the idea of a natural attraction in Long An Province doesn’t seem so improbable. Làng Nổi Tân Lập is located just off National Highway QL62, only 25km from Cambodia. Trucks ply this route to and from the border, which is a shame because the noise from the road can be heard from within the Floating Forest, distracting slightly from the peace and stillness of the natural environment. The entrance to the Floating Forest is marked by a large gate and an enormous car park, which, if you visit during the week, will be entirely empty, but on weekends is likely to be full. Despite being open for several years now, construction is still ongoing: the reception and ticket office was surrounded by cement mixers at the time of my last visit. New accommodation was being built and more activities are in the pipeline. Don’t let these first impressions put you off, because things only get better the further into the forest you go. At the ticket office, the price list for all activities, accommodation, and food and drink is in Vietnamese and English. Staff are nice and helpful (although a bit robotic) so there shouldn’t be any problem buying your tickets. There are essentially two activities on offer (although this will change in the near future as new ones are opened), but because the price is so cheap you may as well buy tickets for both: entrance (including a short ferry ride to the forest proper and access to the raised walkways through the trees) is 60,000vnd, and a 30-minute ride in a canoe through the floating forest is an additional 40,000vnd. Together it’s only 100,000vnd ($5) per person. Considering you can stay in the forest for hours, just wandering around on the raised walkways, this is pretty good value for money. If you intend to stay the night at the Floating Forest, there are two types of accommodation: camping (100,000vnd for a two-man tent, which is pitched near the entrance, rather too close to the road to be peaceful), and an eight-storey hotel, which is located inside the Floating Forest. 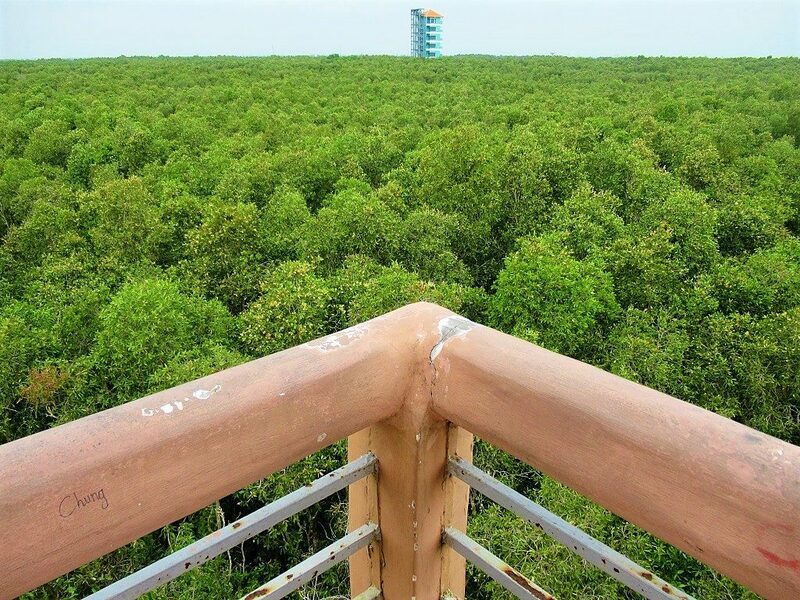 As this is by far the tallest structure for miles around, there are fabulous panoramic views, over the forest canopy and wetlands, from the balconies. 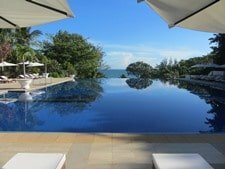 Prices range from 560,000-1,080,000vnd ($25-$50) a night depending on the floor level, day of the week, and number of guests. In my opinion, a night in the hotel is very atmospheric and worthwhile, but camping here isn’t great. Instead, I would recommend heading an hour further west for a night in the excellent lotus lake homestays in Thap Muoi District ($5 a night). Note that there is no food available beyond the reception area, but drinks are sold within the Floating Forest. A motorized canoe whisks you from the reception area to the boat pier on the edge of the Floating Forest. Again, this short ride isn’t very impressive, thanks to large dredging barges, quite a bit of plastic refuse in the murky waters, and lots of cajeput trees being felled in order to create space for more ‘eco’ activities. (This is often the irony of so-called ecological tourist sites in Vietnam: so much of nature is cleared in order to make way for the ‘eco’ developments.) But don’t despair, because it does get better. The boat pier is a pretty spot under the shade of trees. 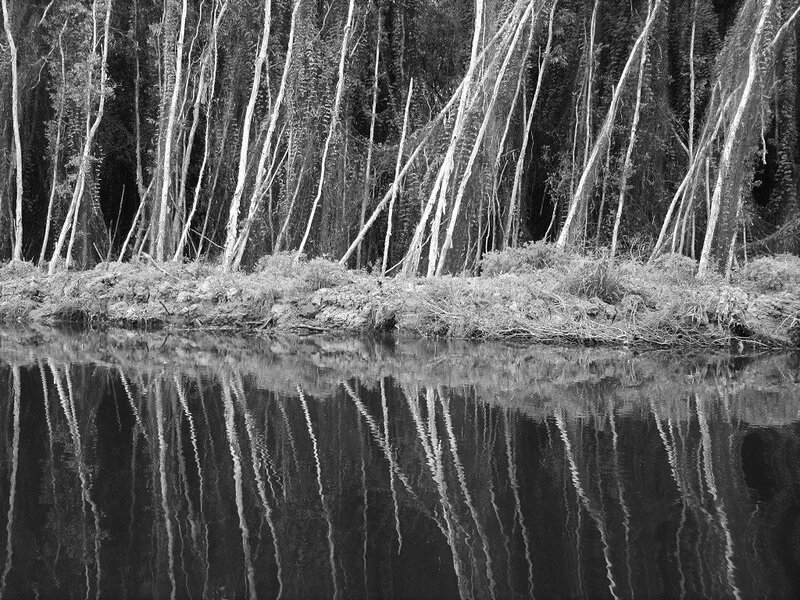 This is where little canoes depart, rowing through narrow channels between the cajeput forests. The hotel is also located here, on the banks of the waterway, and the network of raised concrete walkways leading through the forest all begin and end here. Take care when boarding the canoe, because they are very ‘tippy’ vessels. 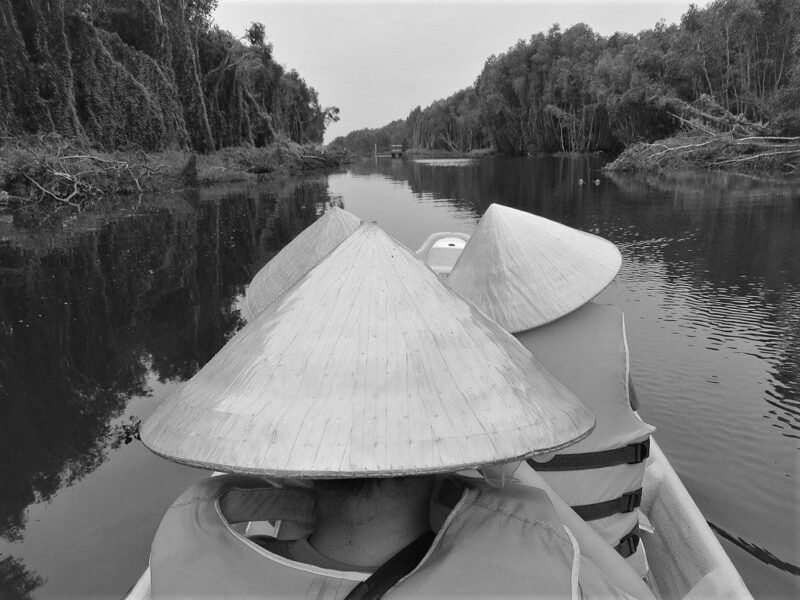 You’re required to wear a life jacket, and everyone is provided with a nón lá (traditional Vietnamese conical hat) to keep the sun off your head. 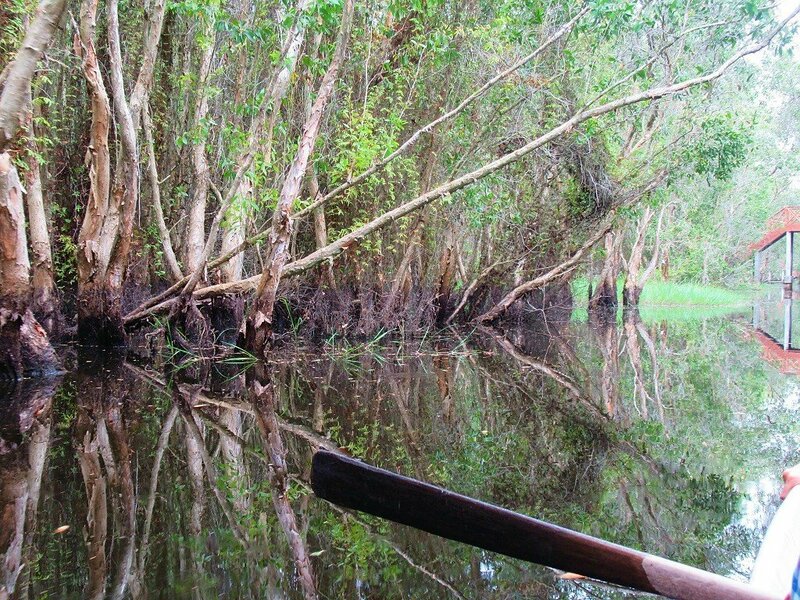 The first ten minutes of the canoe ride are unremarkable, but once you turn down the tight, narrow channels, within inches of the dense cajeput trees, it’s very beautiful. The light just about filters through the canopy, illuminating the strange, papery bark of the trees. It’s eerily still and quiet in the narrow waterways as you row between tree trunks and under the arches of several walking bridges. The atmosphere is hot, heavy and steamy. It’s easy to imagine yourself in a scene from Indiana Jones: crocodiles lurking beneath the surface of the black water, guarding the site of some ancient holy relic. But the crocodiles, if there ever were any, are long gone, and the general feeling I had was one of peace, reflection, and tranquility. The canoe ride is a half hour loop, ending back at the boat pier. 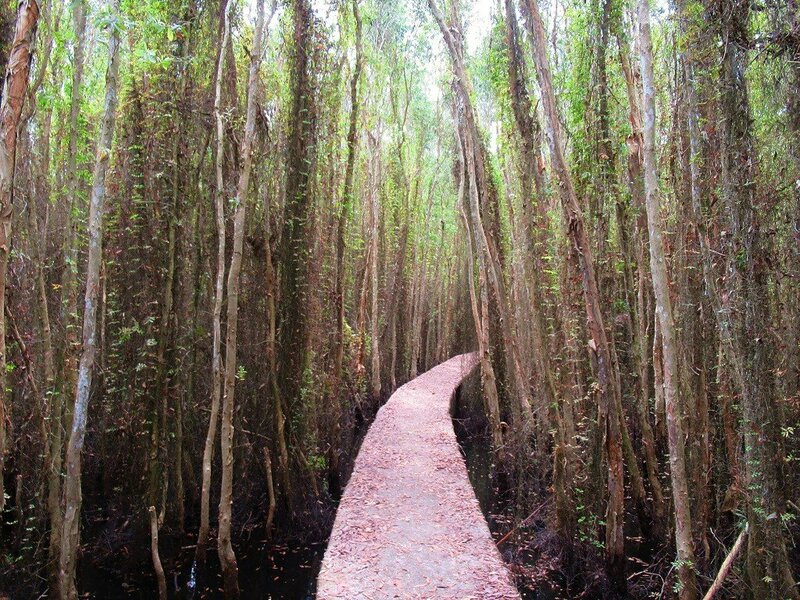 From here, head on foot into the forest on one of the concrete pathways, which wind under the canopy, a few feet above the water, for more than five kilometres. There’s a map of the walkways before you enter, but it’s difficult to get lost because they all lead back to the boat station eventually, and there are regular signposts in the forest. A few bamboo shacks provide drinks, bathrooms and rubbish bins along the way. 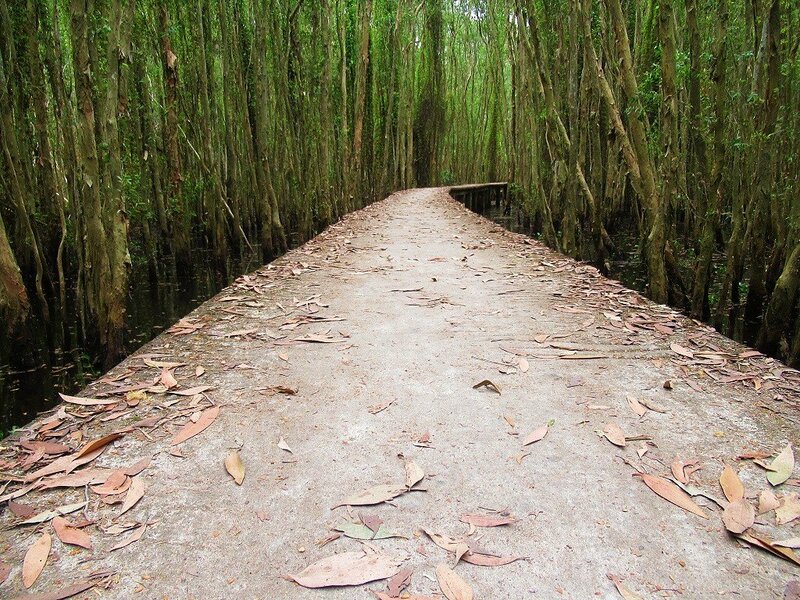 Providing you visit on a weekday, walking in the Floating Forest is very rewarding. You could easily spend a couple of hours exploring all the meandering routes – through the trees, over lakes filled with blooming water lilies, up to the top of a look-out tower, over wooden bridges – stopping to read a book, listening to the sounds of nature (and the road), and just generally wallowing in the fact that only a few hours ago you were riding through the soot-covered industrial suburbs of Saigon, and now you’re in the calm embrace of a floating cajeput forest. The density of trees does something strange to the quality of light under the canopy. The colours are vague, washed-out, and muted, like the sepia tones of an old photograph or an Instagram filter. The raised walkways, strewn with fallen leaves, are themselves very photogenic. The pathways twist between the trunks in front of you, before being swallowed up by the trees. Indeed, the Floating Forest has become a favourite place for Vietnamese youth to come on weekend road trips for a session of selfie-taking. Back at the boat pier, a motorized canoe will take you back to the reception area near the entrance. 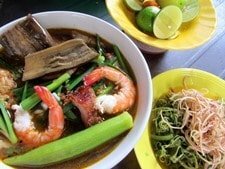 If you’re hungry, lunch is served in the dining shack next to the car park, but there are also local rice eateries in Thanh Tan town, 15 minutes back down road QL62. This entry was posted in ALL, DESTINATIONS, Forests, Mekong Delta, Near Saigon, The South and tagged day trips, forest, indigo, Lang Noi, Long An, Mekong Delta, Saigon, Tan Lap. Bookmark the permalink. Thank you for the updates. I appreciate it. Inspired by this post, I am now attempting to make a trip out to visit Long An. However, I messaged a few tour companies but there seems to be none that offer rides to Long An. It is rather unfortunate that I don’t know how to ride a bike which is what most of them have recommended… do you have any private driver / tour company that you can recommend who would be able to take me from Sagion to the area for the next few days? Thanks so much! Sorry to hear that. Yes, it is quite difficult to get to without your own transportation. 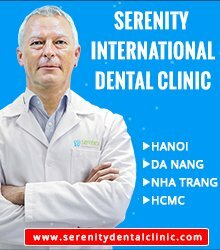 I would suggest hiring a car and driving from Ho Chi Minh City to take you there. Most tour companies should be able to arrange that for you, but of course it’s not cheap: probably around $100 a day for the car, driver, and driver’s expenses. Thanks so much Tom for your reply! 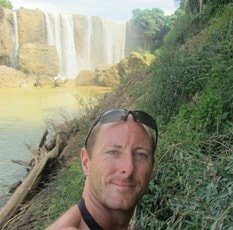 I enquired at a few tour companies and all quoted at least USD150/day which will add up to a significant sum since I would like to spend 2- 3 days out there and am traveling solo so I’ll have to bear the full cost. Will try to make this trip the next time I’m in town with friends! Thanks again and really love your website! Lovely article. What month is best weather?. We live in VungTau and can go any time. We walk daily 10- 20km and this looks like a fun experience. Thanks, 2 expat American seniors.